I finally finished the Valentine’s for my girl’s parties on Tuesday and if you want some last minute ideas, here is what we did. 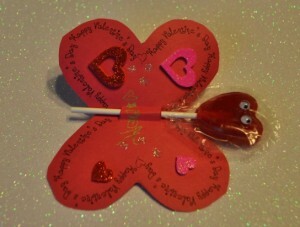 I made the Butterfly Valentine’s above for my little diva. These were actually really easy to do- I just used the free Valentine’s Day card template from Skip to My Lou and printed them out on construction paper. We used a little carton of sticky hearts to embellish the wings- my 4 year old was responsible for that. She also wrote her name in the center in gold pen and then we did some extra pink glitter dots on the sides. I hot glue gunned the googly eyes onto the lollipops and then taped the back to make them more secure. Done! The photo above is how they are supposed to look and the photo below is how ours turned out. I think I like the round heads better. If you have a little heart hole-punch (they are $1 at Michael’s)- that could be an even simpler way to embellish the wings. And then for my little Maya, I saw these super hero Valentine’s in a magazine and they are perfect for her. So I decided to make a girl version of the Super Hero and these are really cute in person. 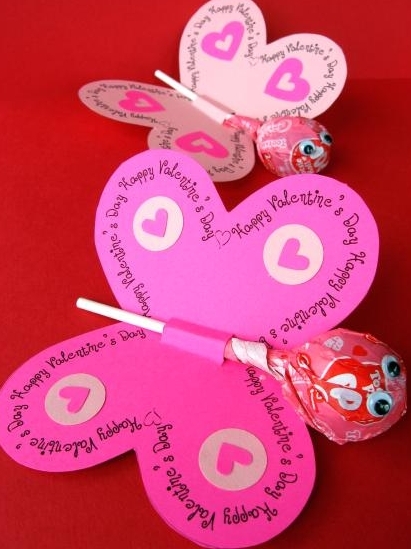 The directions to make these are pretty simple but these took us a lot longer than the Butterfly ones to make. Also, since Maya is 2 she was much more interested in eating the lollipops then doing the project. So I couldn’t find Tootsie Pops and got Blow Pops instead (amateur mistake since I have girls- long hair and gum is not a good combo). I think the Blow Pops turned out kind of cute though since the extra wrapping on top looks like a pony tail. I grabbed gold star scrapbook paper ($.99 for 2 sheets) and a glittery scrapbook paper ($.99 for 2 sheets) and just followed the template provided by Zakka Life. I used plain white card stock and just cut triangles and wrote “You’re Super!” and then hot glued that to the cape. We wrote Maya’s name on the back side of the cape and then just colored in the eyes to make the mask. 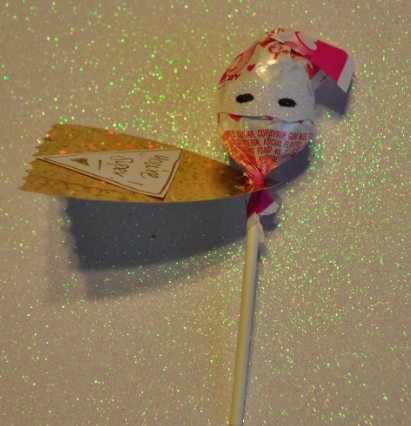 I hot glued the mask on and cut an X with a utility knife so the cape is nice and tight around the lollipop stick. If I had more time I would have printed the words on the card stock rather than just writing it in. So this is how they turned out. I think the little Super Heros would be very cute favors for Birthday parties. Such cute ideas. Thanks for sharing. Who wouldn’t be interested in eating these lollipops? They are so cute. I’m totally with Maya here 🙂 Thanks for ideas. I don’t have children but wow these are super duper cute!! Very cute! We made chocolate covered Peeps that we saw on Pinterest and we’re attaching cute little photo cards we made from Walmart. Great job! I was going to make homemade Valentine’s cards, but went with the nicely priced Laffy Taffy premade Valentine’s cards. I PM Meijer ad at Target, used $1/1 Willy Wonka IP and paid $1.50 for 24 cards with candy (I bought 2 packages for my 2 kids that still need cards, oldest son doesn’t do parties anymore). 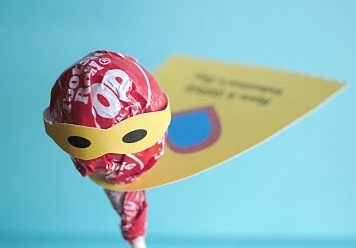 wow cool.It looks so cute and cool idea with the lollipop!!!! Wow.It looks so cute and cool idea with the lollipop!!!! I’ll give each one a try. What cute ideas. And simple too. Will save them for next year. Thanks for sharing.